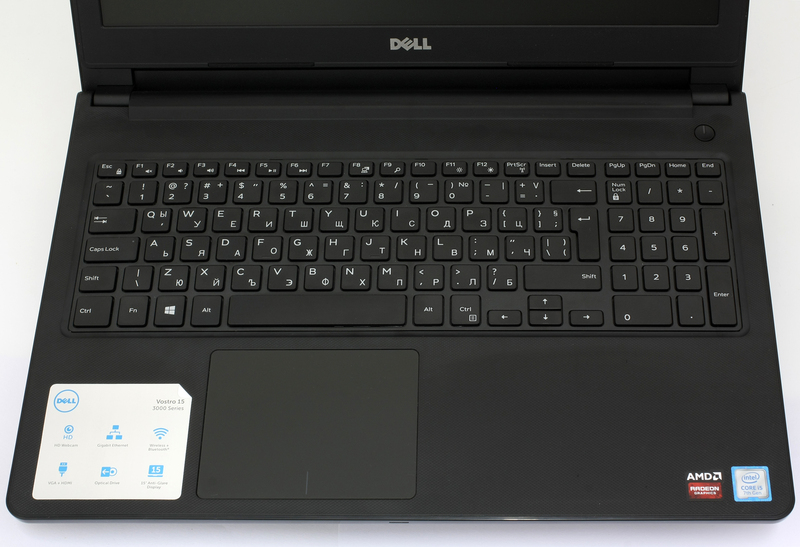 Here we are with another alteration of the ultra-affordable Vostro laptops from Dell. Last time we reviewed one of these, the Vostro 3559 to be exact, and found quite a few flaws, despite the relatively low price. With the newly updated 3568, however, we hope there won’t be so many shortcomings to be taken into consideration. One thing is for sure, though, the chassis is absolutely identical so we are bound to see some of the issues here as well. In any case, it’s good to see the new Kaby Lake processors from Intel popping out in the entry-level segment of the market. The configuration we are currently testing features a Core i5-7200U CPU and a discrete graphics card from AMD – the Radeon R5 M420X for just around €400-450. Absurd, right? Well, there are a few trade-offs you have to be willing to accept along the way. Here’s our thought on the product. The retail package isn’t all that different from the usual ones we get from the store. 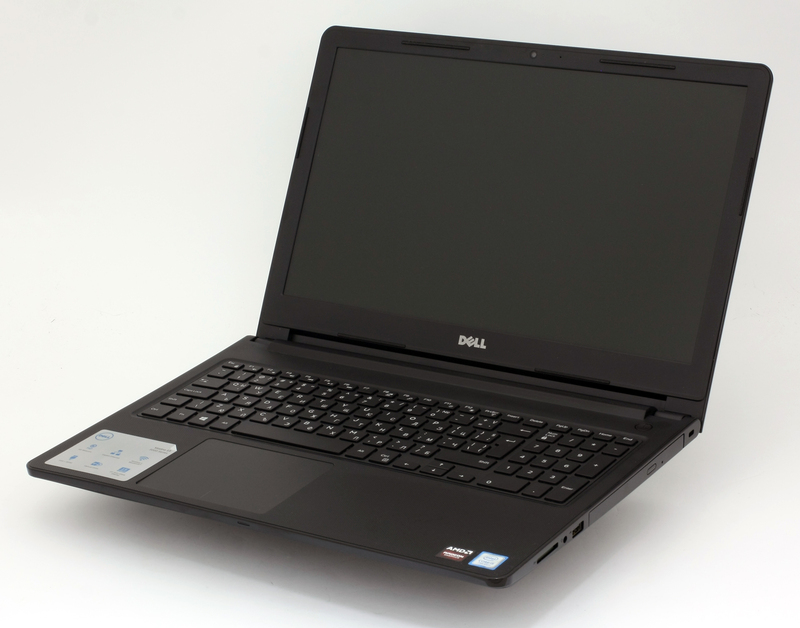 It contains the usual user manuals, AC adapter, power cord and the notebook itself. 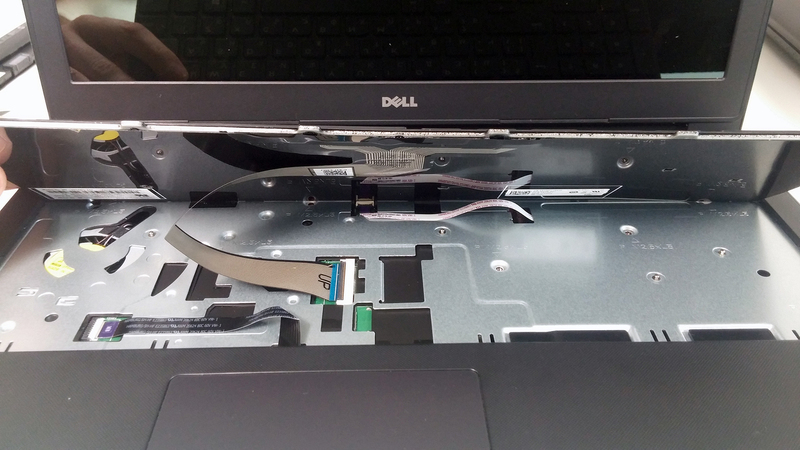 We’ve already reviewed this chassis on two other devices including the Dell Vostro 3559 and it’s always good to get back to a device and see what we’ve missed last time. Well, in this case, there’s not much we need to talk about but we did notice some big issues with the build this time. Either we failed to mention them or this particular unit is deeply flawed. Either way, we are reviewing end production units so this would’ve ended in the hands of a user. The lid is covered in patterned black plastic with slightly rugged finish. It has a nice grip to it but bends quite a lot even under small pressure. Also, the hinge is really overly tightened and you always need both hands to open it. Kudos for the fairly thin screen bezels, though. And as for the bottom piece, we don’t see any significant change offering a user-replaceable battery pack and a few vent openings for extra airflow. The sides are contrasting to the rest of the exterior with a glossy finish and flat edges. The left side incorporates a vent opening, RJ-45 port, VGA, HDMI and two USB ports, one of which is 3.0. 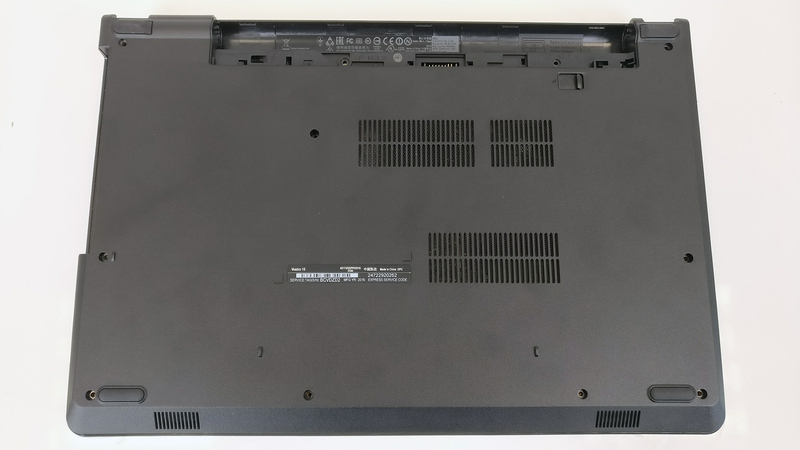 As for the right side, you will find the optical drive, another USB 2.0 connector, 3.5 mm audio jack and the SD card reader. Coming from the previous version, this chassis is still about 24 mm thick so no significant change here either. And now the most controversial part. The interior uses the same plastic found on the lid with slightly rugged finish easily attracting fingerprints and smudges but that’s not the problem here. We found that the keyboard area is spongy while the whole base twists quite easily. For example, the wrist rest area is so flexible that even resting our palms causes significant deformation. 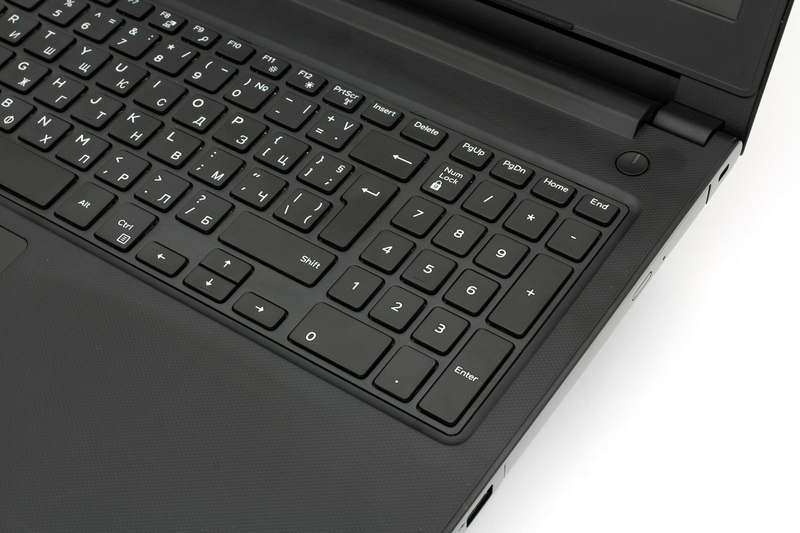 Moreover, we found out that while using the touchpad, the flexing of the base caused it to get stuck with a left or right mouse click so we had to lift our hands from the palm rest area to release the touchpad. However, we were happy with the touchpad itself. It has good gliding surface, light mouse clicks and appeared to be pretty accurate. As for the keyboard, well we can’t really say anything bad or good about it. The keys have short travel but clicky feedback so it’s more of a personal preference. We really can’t get too picky considering the price point of the Vostro 3568. 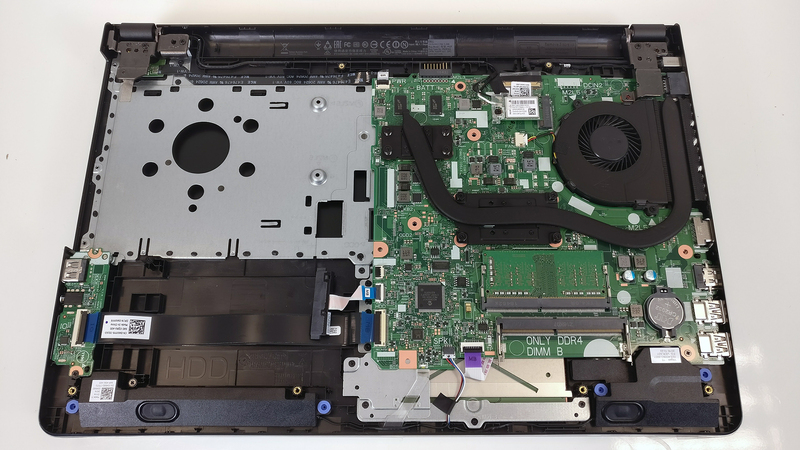 As we said numerous times before, it’s really hard to review an ultra-budget notebook because it’s bound to have some issues with the design or build quality. You will find those issues in virtually every other similarly-priced product. However, the drawbacks here were so prominent and annoying, we just can’t overlook them. 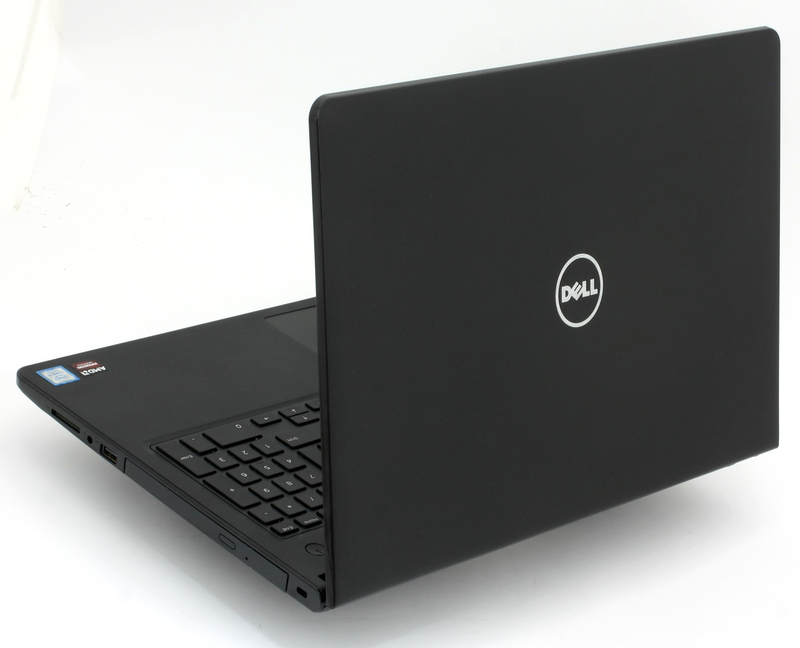 We guess, gone are the days of the super solid and affordable Vostro laptops. 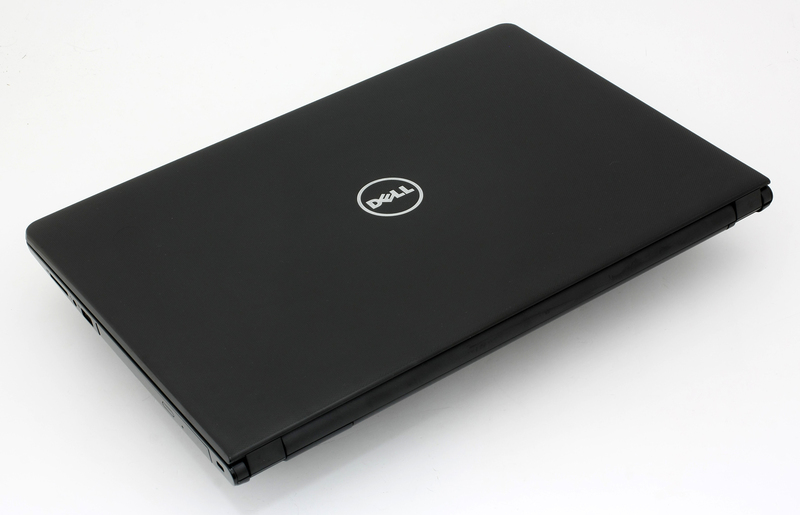 The case of the Vostro 3568 is largely the same as the one of the Vostro 3559 and the Inspiron 3552 with a small but noticeable difference. The Vostro 3568 doesn’t offer a dedicated service cover for easy upgrade but instead, it requires a full disassembly to just swap your 2.5-inch drive or RAM sticks. At least the battery can still be removed without any tools. 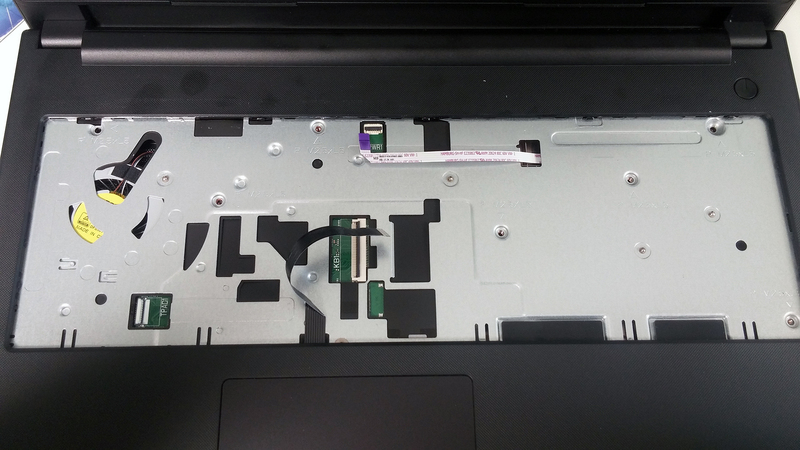 Don’t forget that you still need to remove the keyboard, optical drive and pop out the battery before you proceed. The usual for this price range storage upgrades are available. 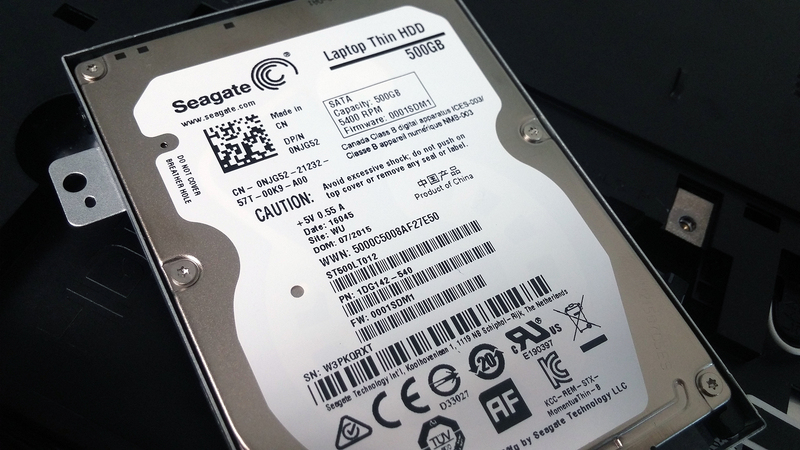 The Vostro 3568 offers only 1TB of 2.5-inch HDD and no M.2 SSD slot. If you need the extra storage, though, you can always swap the optical drive. 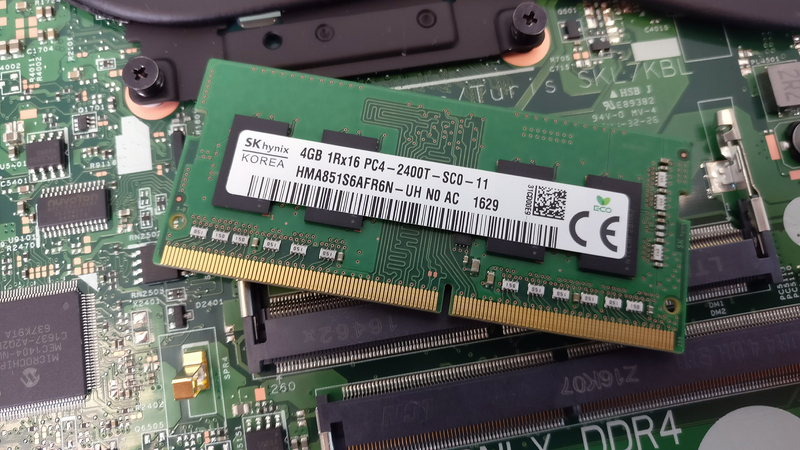 Surprisingly, the motherboard holds two RAM slots, one of which is occupied by a 4GB DDR4-2400 SK Hynix chip. The Wi-Fi card can be found near the cooling vent. 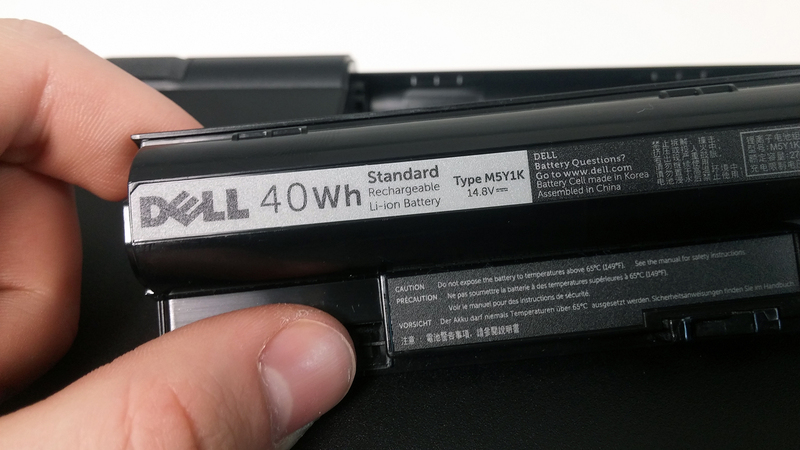 The battery remains the same and it’s rated at 40Wh. 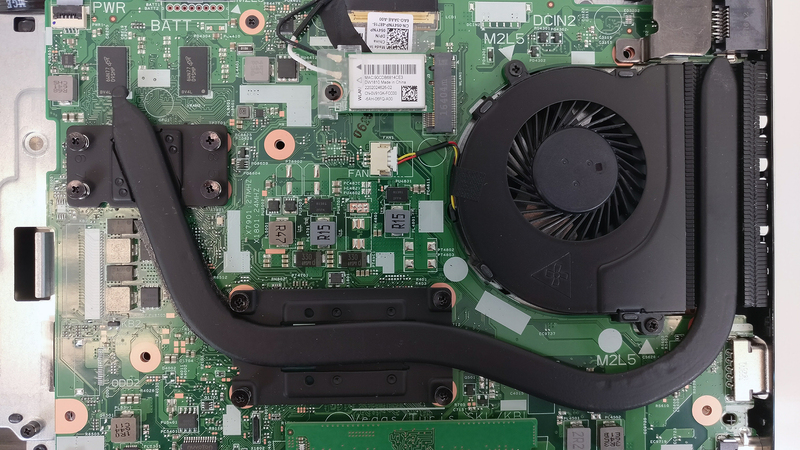 The cooling design is super simple – just one heat pipe going across both heat sinks connecting the cooling fan. 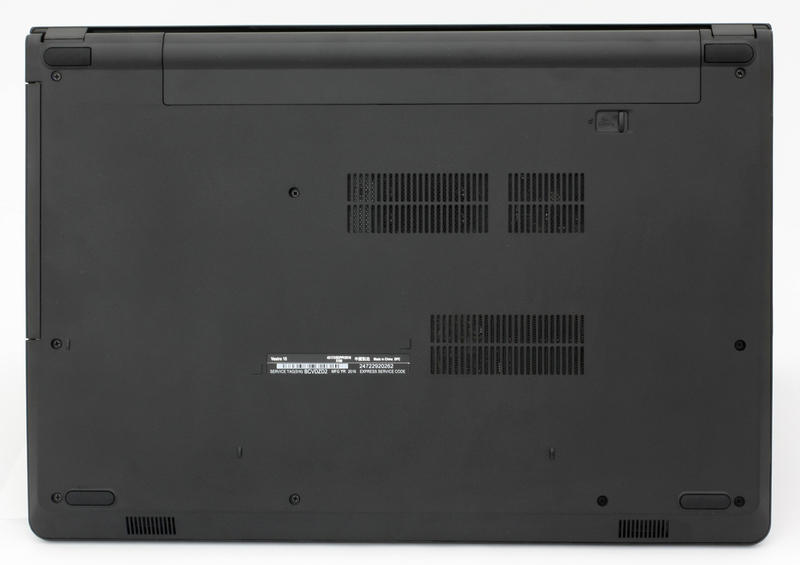 The notebook’s display uses a standard low-end TN panel manufactured by BOE with model number FVGPP-NT15N42. The panel offers 1366 x 768 (HD) resolution in a 15.6-inch diagonal leading to a pixel density of just 100 ppi and 0.253 x 0.253 mm pixel pitch. It can be considered as “Retina” when viewed from a distance equal or greater than 86 cm. Viewing angles are poor due to the nature of TN panels. We measured a maximum brightness of 243 cd/m2 in the center of the screen and 235 cd/m2 as average across the surface, which means that the maximum deviation is 14% in the lower left corner. 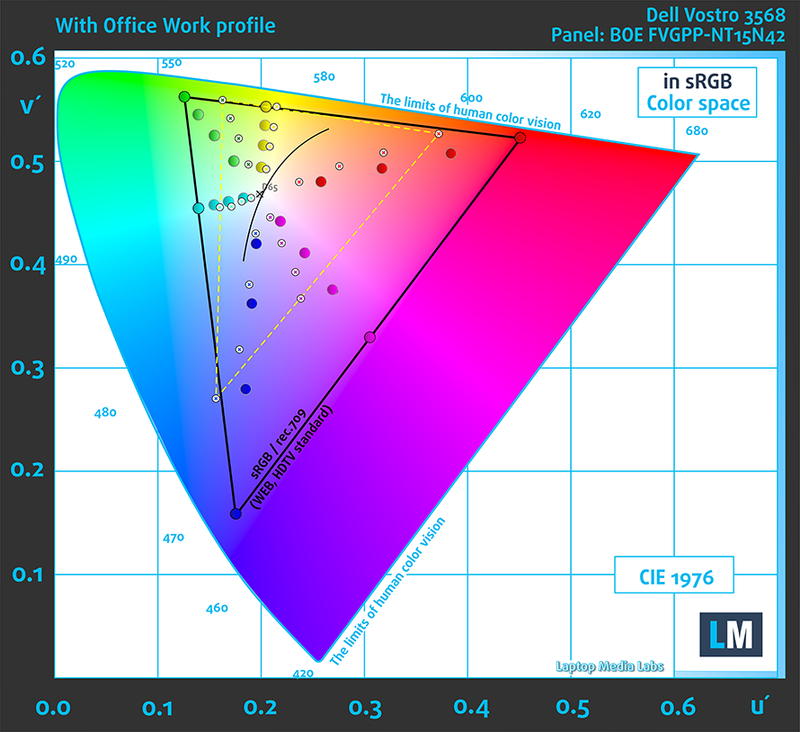 The color temperature is 6300K and it’s quite close to the optimal 6500K with 310:1 contrast ratio. The maximum color deviation (dE2000) is 3.4, which is kind of nice when you take into account that values above 4.0 are unwanted. Quite expectedly, the display’s sRGB coverage doesn’t go above 49% so a little more than half of the web/HDTV colors are missing. Below you will see practically the same image but with the color circles representing the reference colors and the white circles being the result. You can see main and additional colors with 25%, 50%, 75% and 100% saturation inside the sRGB gamut before and after calibration. We created the “Office work/Web design” profile with a target color temperature of 6500K (D65), optimal gamma under sRGB mode and 140 cd/m2 luminance. Unfortunately, the notebok’s display uses PWM from 0 to 99% screen brightness and the frequency of the emitted light is low and can be considered as “aggressive”. We strongly recommend using our Health-Guard profile when planning on working for long periods of time. Installing of our Health-Guard profile not only eliminates PWM but also reduces the harmful Blue Light emissions while keeping the colors of the screen perceptually accurate. If you’re not familiar with the Blue light, the TL;DR version is – emissions that negatively affect your eyes, skin, and your whole body. You can find more information about that in our specialized article on Blue Light. The panel has obvious downsides like low sRGB coverage, inaccurate color reproduction, extremely low contrast and uses PWM from 0 to 99% brightness. It carries the typical issues for a low-end TN display. However, we have to note that the color temperature is close to the optimal 6500K and the maximum recorded brightness is considerably higher than what we are used to seeing at this price range. No major distortions were found in the low and high frequencies. We used a fresh copy of Windows 10 (64-bit) for the writing of this review. 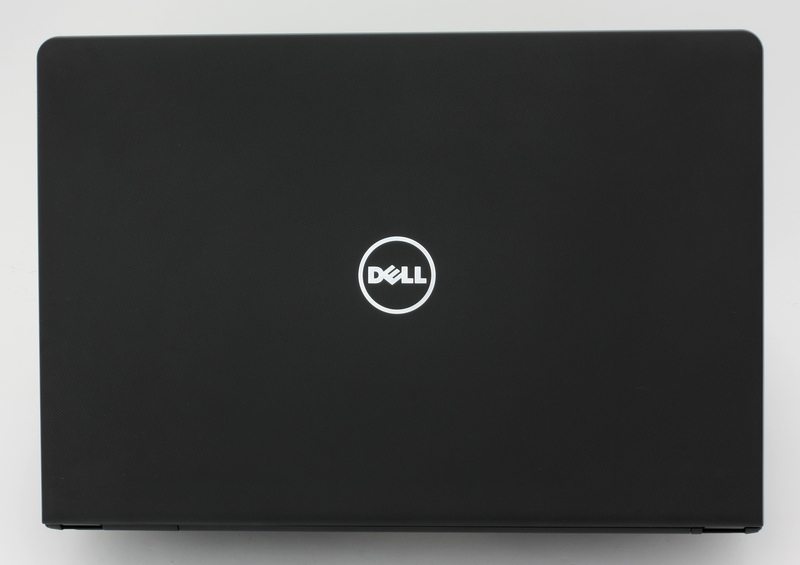 If you are going to perform a clean install as well, we suggest downloading all the latest drivers from Dell’s official support page. 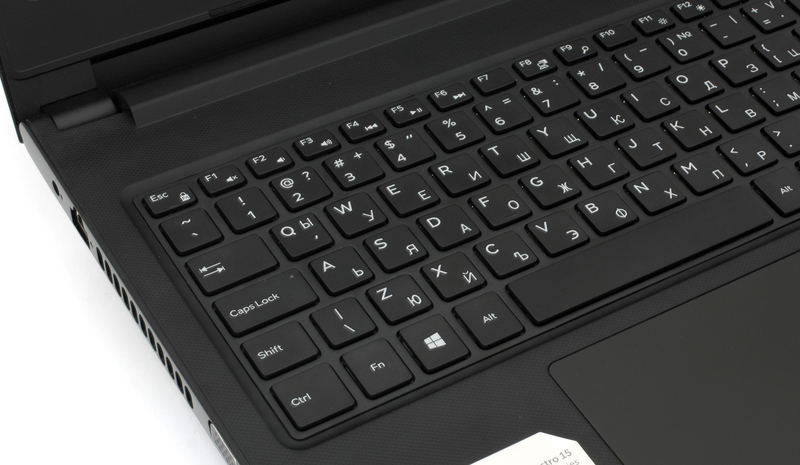 We were quite surprised by the notebook’s battery life, especially compared to the Vostro 3559. 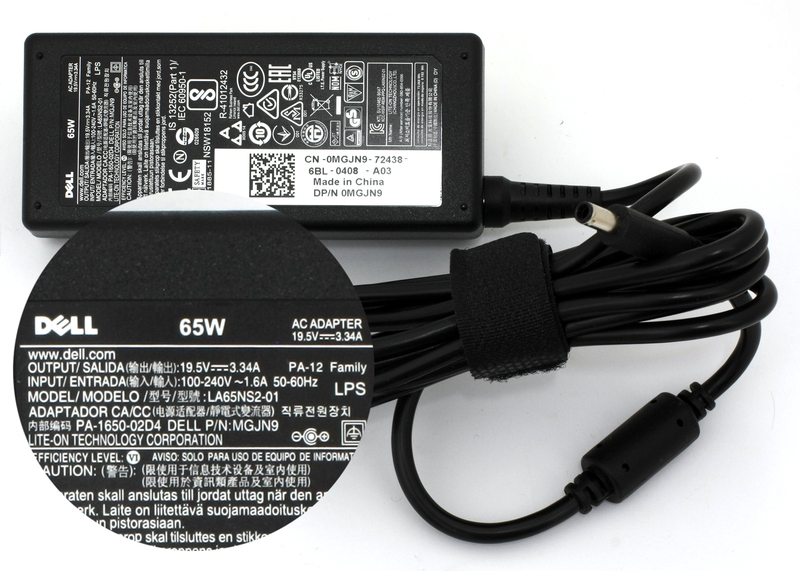 We got some outstanding browsing and video playback runtimes on the same 40Wh battery unit. Probably the new Core i5-7200U CPU is the one to blame. As usual, we ran the usual stress tests using the same settings as always – Wi-Fi turned on, Windows battery saving feature switched on and screen brightness set to 120 cd/m2. Oustanding browsing times – 560 minutes (9 hours and 20 minutes). Considerably lower, but still an excellent score – 453 minutes (7 hours and 33 minutes). Intel’s Core i7-7200U is part of the 7th Generation Kaby Lake CPUs and it’s the direct successor of the Core i5-5200U (Broadwell) and Core i5-6200U (Skylake). It’s also based on the same architecture as the aforementioned chips with little differences that should bring a small performance increase and a bump in power consumption. However, the new CPU is clocked at 2.5 GHz and its Turbo Boost frequency is 3.1 GHz opposed to the 2.3 – 2.8 GHz clocks on the previous Core i5-6200U. Fritz is a chess benchmark that tests the computing capabilities of the CPU with various chess moves. 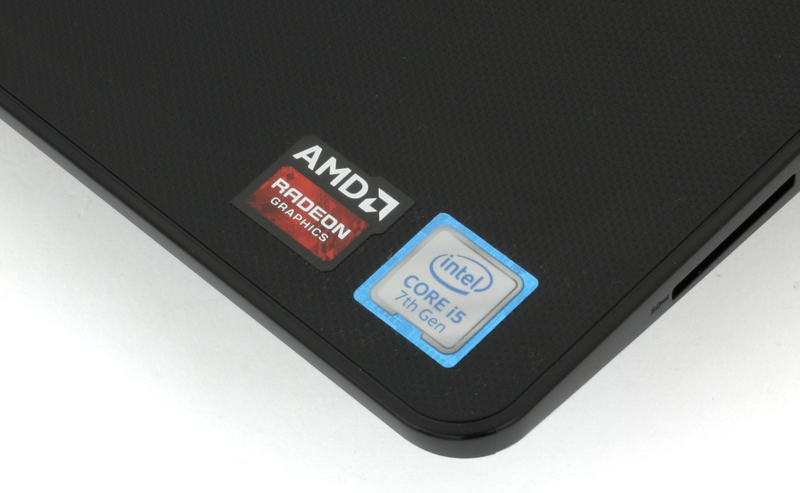 The Intel Core i5-7200U scored 6.405 million moves per second. In comparison, one of the most powerful chess computers, Deep(er) Blue, was able to squeeze out 200 million moves per second. In 1997 Deep(er) Blue even beat the famous Garry Kasparov with 3.5 to 2.5. We have no solid information of the GPU at this point but you can find its relative performance in the chart below. The stress tests that we perform cannot be considered as a real-life working environment because the general user won’t be able to reach 100% CPU and GPU load during normal usage. Still, it’s the best way to assess the overall stability of the system and the effectiveness of the cooling design. 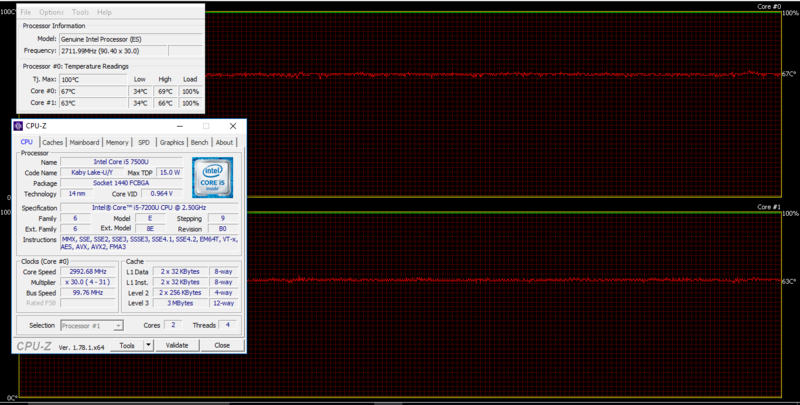 After an hour of 100% CPU stress testing, the Core i5-7200U was able to maintain its maximum operating frequency of 3.1 GHz for some time but then slowly went down to 3.0 GHz. Temperatures were normal as well. 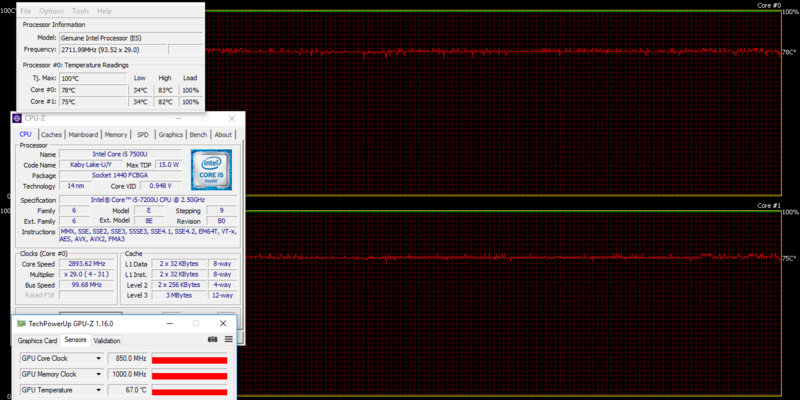 After turning on the GPU stress test too, the CPU’s temperature rose to around 83 °C without dropping below 2.9 GHz. The GPU was able to perform to its full potential at 850 MHz at 67 °C, which is rather high considering that it’s not powerful at all. Temperatures on the surface were totally normal even after the extended stress test. To be honest, the Vostro 3568 doesn’t go too far from the previously reviewed Vostro 3559, which was kind of a disappointment. It inherits the poor build quality, spongy keyboard and underpowered GPU. We honestly think that if Dell decided to just go with the integrated graphics (Intel HD Graphics 620) on the Core i5-7200U, which is the main key selling point of the product anyway, it would have been a lot better. This would have save power and it would have taken a few bucks off the price of the machine. You can clearly see from the benchmarks that the Intel HD Graphics 620 is, in some cases if not all, more powerful than the Radeon R5 M420X. Anyway, we do have to mention that the display is considerably brighter than the one on the Vostro 3559 but keeps the PWM. Also, battery life is surprisingly good. In fact, it’s so much better than most laptops in this price range even beating more expensive machines. This is really important for businessmen on the go. If you plan on using the notebook with some moderate to heavy multitasking with an external monitor and peripherals but you often require endurance when you are away from the plug, the Vostro 3559 might be a good fit for you. 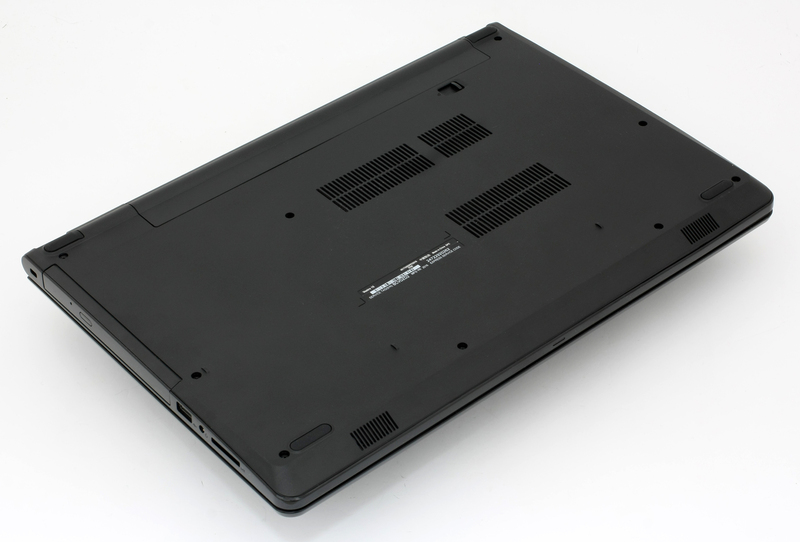 However, if you can trade the Core i5-7200U CPU for a Core i3 with GeForce 940MX in a more reliable/stable laptop, we suggest looking for the lower-end configurations of the Acer Aspire F5-573 or the Ideapad 310 with Pentium processor. If you are looking for something suitable for business, well don’t hesitate to check for some HP ProBook 450 G3s still laying around. What is the distinction between inkjet waterslide documents and laser decal documents.